The recipe boils down to bread chicken, sear, put in pan with cheese and pasta sauce, stick in oven. I set out 2 plates. I squirt some lemon juice in one plate. I pour some bread crumbs on the second plate. Then I dip a chicken breast in the lemon juice then I plop it down in the bread crumbs on both sides. Sear in a hot pan for 1-2 minutes per side. Repeat for each chicken breast. Put breaded chicken breast (no the breadcrumbs never stay on perfectly but whatever) in 9×9 glass pan (or whatever you have). Put one piece of cheese on each breast. Cover with an adequate amount of pasta sauce. I like Rao’s pasta sauce. I probably use about a half bottle. Cook at 400 for about 30 minutes (I’m a big internal temperature person…so I check the internal temperature according to my chart). By request I also make pasta. 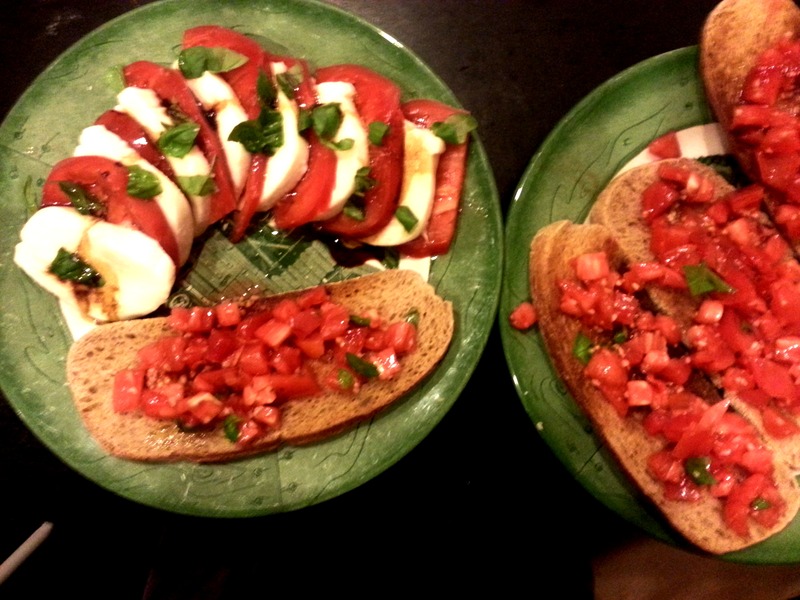 And if I have more time I make Bruschetta and a caprese salad. Pretty much do the same thing as above minus the oven part. Dip in juice..cover in crumbs. Cook in pan until done on each side. Throw in a bag of microwavable veggie in the microwave. Make a salad if I’m feeling ambitious. I try to focus on veggies at dinner. We usually don’t have a side of rice or quinoa or whatnot. Oh the wine is just … after the pork has cooked…throw in a 1/2 c of red wine and scrape up the flecks of pork/bread crumbs into the wine and maybe add some corn starch if I want it to be thickish. Cook ground beef until thoroughly cooked. Drain out fat. This last time I added in white wine to cook in the beef after removing the fat and added in Portobello mushrooms until they were cooked. Layer pasta sauce, lasagna noodles, beef, cheese repeat. Cook according to directions which were something like 25 minutes at 400. I like the stick in oven for 30 minutes option after working for max ten minutes.